Were you inspired by the Olympics to see more of South America? Maybe you want to party during Carnival in Rio? Or perhaps you’re drawn to the continent’s stunning natural wonders, such as the Amazon River, Galapogos Islands and Iguazu Falls. Whatever the reason, you can get there for nearly free in as little as three months with the right credit card. To figure out the best rewards cards to get, we looked at redemption rates for routes between major U.S. and South American hubs. Remember that no flight is completely free. You’ll have to pay at least $50 for awards to South America from the U.S. For the routes we looked at, the cash cost never rose above about $100. Below are the best cards to get to earn an award flight to South America. 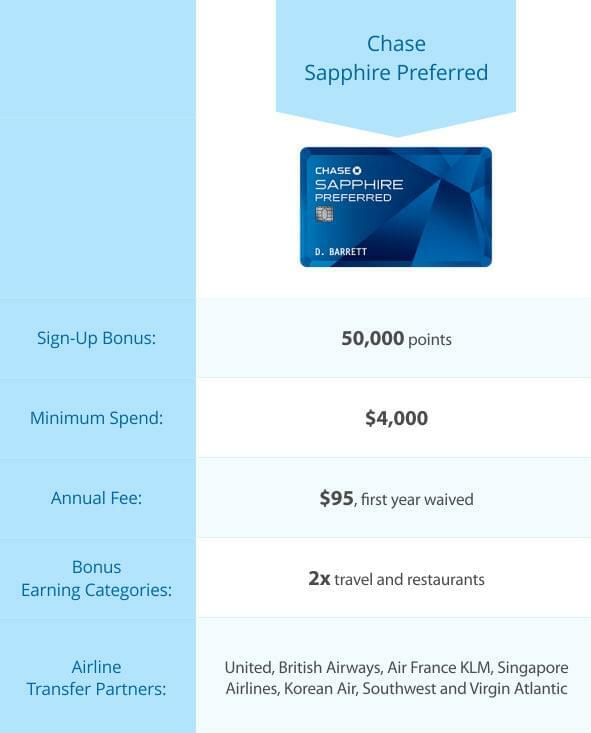 The Chase Sapphire Preferred card tops the list because of its generous sign-up bonus and flexibility. You’ll get 50,000 points after spending $4,000 within three months, and because those points are part of the Ultimate Rewards program, you can transfer them to seven different frequent flyer programs. That gives you several options for getting to South America. Depending on your route, you can get a ticket for as little as 50,000 points by transferring to British Airways Executive Club and booking a flight on American Airlines or LATAM Airlines. Or you can use Flying Blue, the frequent flyer program for Air France and KLM, and book a flight on Delta or Aerolineas Argentinas for the same cost. United MileagePlus, another Ultimate Rewards transfer partner, offers flights for only 60,000 miles. You can book flights on United, Avianca and Copa Airlines to various locations. MileagePlus offers some of the lowest fees of any of the programs mentioned in this post. With this card you can add points earned with either the Chase Freedom or Freedom Unlimited card to your Ultimate Rewards account. Adding one of these cards to your wallet is a no-brainer if you already have a Sapphire. They have excellent earning potential and no annual fee. The standard Freedom card will give you an impressive quintuple points for purchases that fall into quarterly rotating categories, which can be anything from gas stations and restaurants to big box stores and online purchases. The Freedom Unlimited card is more straightforward, giving you a solid return of 1.5 points per dollar spent on everything. The Starwood Preferred Guest card from American Express has three major strengths: 30 airline transfer partners, a 5,000-point bonus with every 20,000-point transfer to an airline, and a sign-up bonus of 75,000 points after spending 3,000 in the first 3 months. The one major drawback is its limited bonus earning categories. You’ll only get a bonus for Starwood hotel purchases. Chase Ultimate Rewards’ partners British Airways Executive Club, American AAdvantage and Air France KLM Flying Blue also partner with SPG. The other SPG partners that are good for getting to South America are Alaska Airlines Mileage Plan, JAL Mileage Bank and ANA Mileage Club. Alaska offers the cheapest redemptions to South America at only 40,000 miles on American. JAL, which uses a distance-based award chart for redemptions on partner airlines, has the same rate of 40,000 miles for some routes, but it can go up to 55,000 miles or more to certain destinations. ANA’s redemptions are 55,000 miles across South America on its partners Avianca, Copa Airlines and United. The American Express Premier Rewards Gold card is the last card with transferable points to make our list. 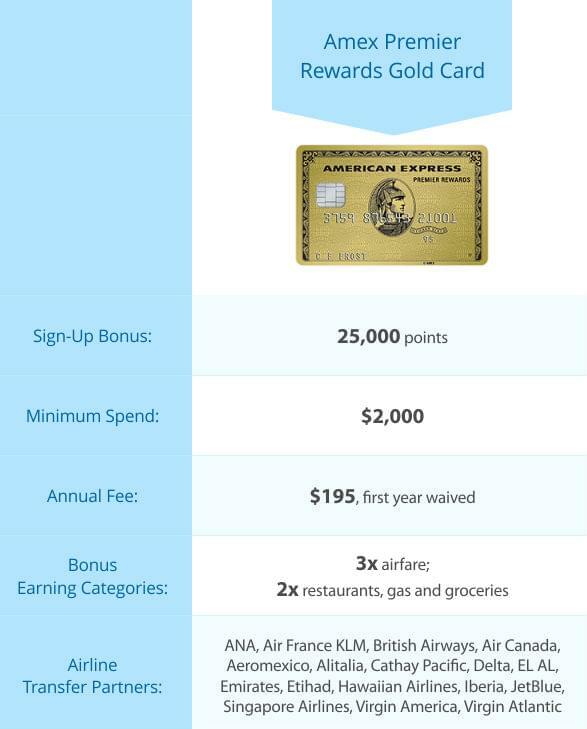 While it’s a very flexible card with 17 airline transfer partners, and it has impressive earning scheme that offers triple points for airfare and double points at restaurants, gas stations and grocery stores, its sign-up bonus is only 25,000 points and its annual fee is $100 dollars more than Sapphire or SPG. For getting to South American, you can transfer your American Express Membership Rewards points to ANA Mileage Club, Air France KLM Flying Blue and British Airways. Co-branded airline cards don’t typically top travel hackers’ card lists. That’s because they don’t give you many options. You’re tied to redeeming through one frequent flyer program, and if there isn’t any award availability on the dates you want, or if the redemption rates are bad, there’s nothing you can do about it. 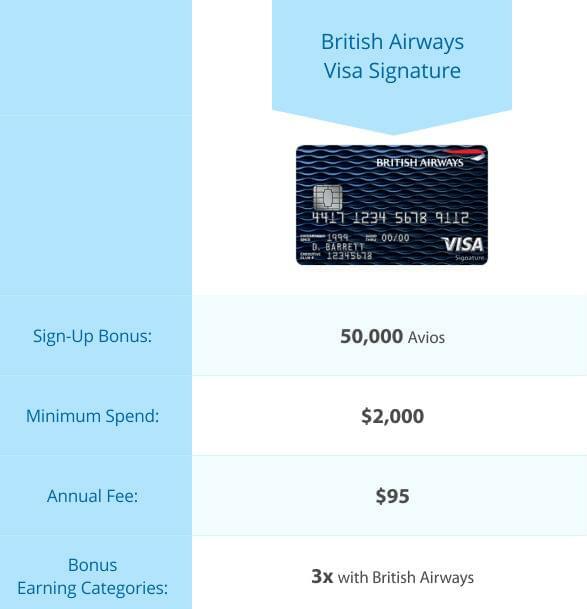 That said, the British Airways Visa Signature card made this list because of its generous 50,000-Avios sign-up bonus. That’s enough to get you to some parts of South America on American or LATAM, particularly if you’re flying from the East Coast. Keep in mind, though, that you’ll be out $95 even if you cancel the card in the first year since the annual fee is not waived. The biggest problem with British Airways’ program is that it adds prohibitively high fuel surcharges to award flights on its own metal and on some partners. That’s particularly true for long-haul international flights, such as U.S.-Europe routes. While the airline still offers decent redemptions for short-haul flights, the program is more limited than many other carriers. 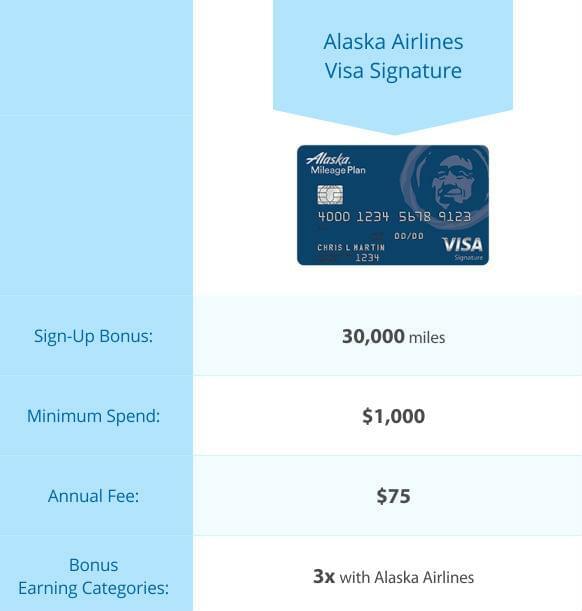 Alaska Airlines Mileage Plan has some surprisingly good redemptions, particularly on its partners. A round-trip award flight to South America on American through Alaska’s Mileage Plan cost only 40,000 miles, but that same flight booked through American Airlines AAdvantage program costs 60,000 miles. If you live in an area served by Alaska, you’ll probably want the Alaska Airlines Visa Signature for more than a one-off award to South America. It comes with a very generous annual companion fare. For just $99 plus taxes and fees, you can take someone with you on an Alaska-operated flight. That perk can be worth hundreds of dollars and, if you use it, it will certainly cover the $75 annual fee. Chase Sapphire Preferred is the obvious choice. With the sign-up bonus alone you can get an award flight to South America. On top of that, it’s a flexible card with seven airline transfer partners and a solid earning scheme. You’re likely to want to keep this card for years. If you already have the Sapphire, or you don’t think it’s the card for you, consider getting a couple of the other cards. Many of them overlap airline transfer partners, so you could combine sign-up bonuses to earn an award flight even quicker. Add the Alaska card to the SPG Amex or the British Airways card to the Amex Rewards Gold and you’ll have enough to fly anywhere in South America after getting the sign-up bonuses.